After an 11 hour flight with drug-aided sleep, we arrived in Zurich. The Euro Cup soccer tournament has been taking place across Switzerland, and we strolled downtown to watch the Portugal vs. Germany game at the 'Fan Zone', a cordoned off area of downtown for soccer hooligans. We decided to "Go Big" since we didn't have anything to do the next day except fly. Rookie mistake! Flying with a hangover is the worst, but the business class seat made it somewhat bearable. I'm definetly spoiled. We arrived in Nairobi after dark and were ready to hit the town, but with the locals repeated warnings against going anywhere (even a block from the hotel) we decided to play it safe. Nairobi isn't nicknamed Nairobbery for nothing. We got up early to see what we could in Nairobi before taking a 6 hour bus ride to Aurusha. We went to two conservation centers; one for elephants and one for giraffes. I had to see if the Monahan tongue was longer than the lengedary giraffe. Score one for the giraffe, but just barely. We even met Obama's 'cousin' and we promised that we would tell Obama 'hi' for him. Now if we could only pronounce his cousin's name. 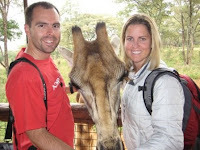 Tomorrow morning we start our safari to Tarangire Natl Park, Serengeti NP, and the Ngorongoro crater. Over dinner, the owner of the safari company, an eccentric German transplant, treated us to some local stories and beers. So far, Tanzania is showing potential.